In recent years Instagram has become a primary marketing platform for businesses, to the point where Instagram profiles are as valuable as company websites. Despite people finding new Instagram accounts via single posts — from hashtags, locations and tagging — once they land on a profile it’s the whole 9 grid feed that will make a lasting impression. 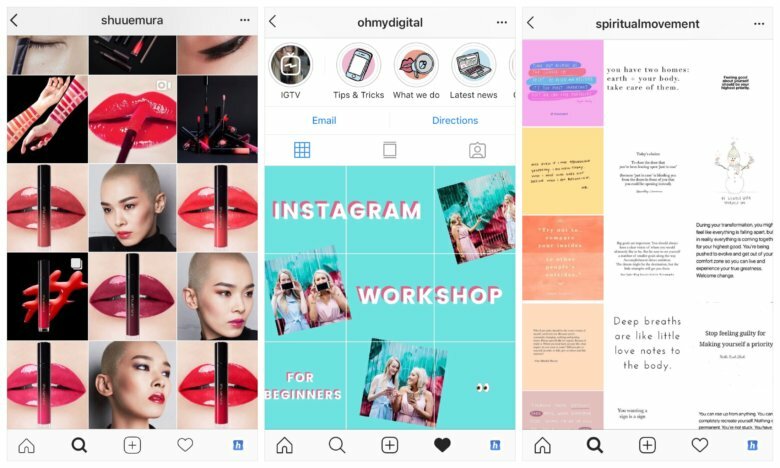 Brands, influencers, and creatives need to therefore make sure their Instagram posts look good when placed all together using an Instagram grid planner! A consistent Instagram feed aesthetic can really affect the overall impact of a profile, which is important to bear in mind when planning your Instagram marketing strategy. There’s something incredibly satisfying about an Instagram account with a clear colour palette. It looks clean, stylish and well-curated. Using a colour palette theme will require an Instagram grid planner to ensure a seamless transition from post to post. If you don’t have a naturally artistic eye, you can use a colour palette generator in order to browse colour schemes and see the kinds of colours that complement each other in photographs. You can either stick to one colour throughout, or use a colour palette to transition through various colours as you scroll! There are many possibilities, and once you decide on a colour scheme you can create content accordingly. 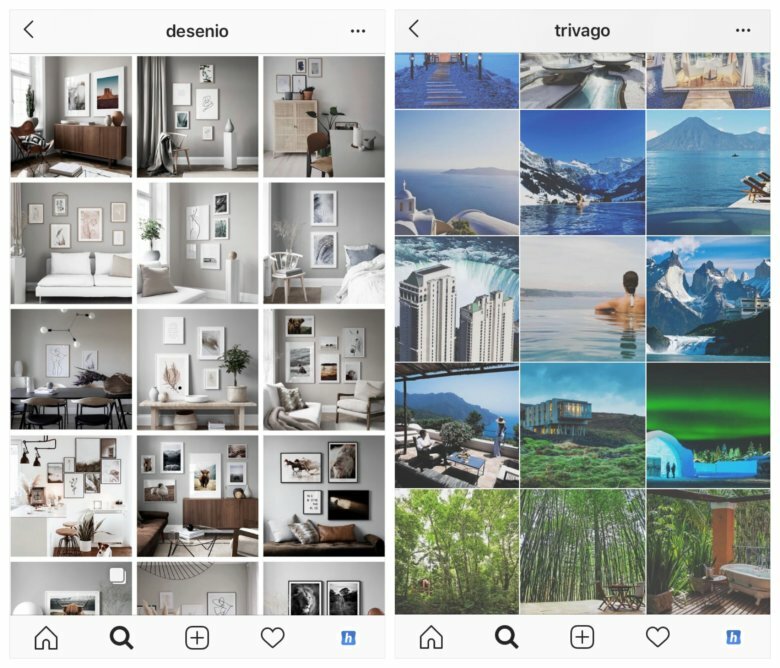 Poster retailer Desenio stick to a grey colour palette to highlight their product, while hotel comparison site Trivago execute a transitional colour themed feed! Another way to create a stand out feed aesthetic is by placing your photos and videos in white borders or frames to create a pattern. This became a common trend back when Instagram only supported square posts, as a hack to not have to crop your portrait and landscape posts! Now it is simply a thematic decision to make your Instagram feed look more like a photo album or brochure. Again there are a number of ways to implement white borders, whether it’s small squares, portrait, landscape, or a mixture! 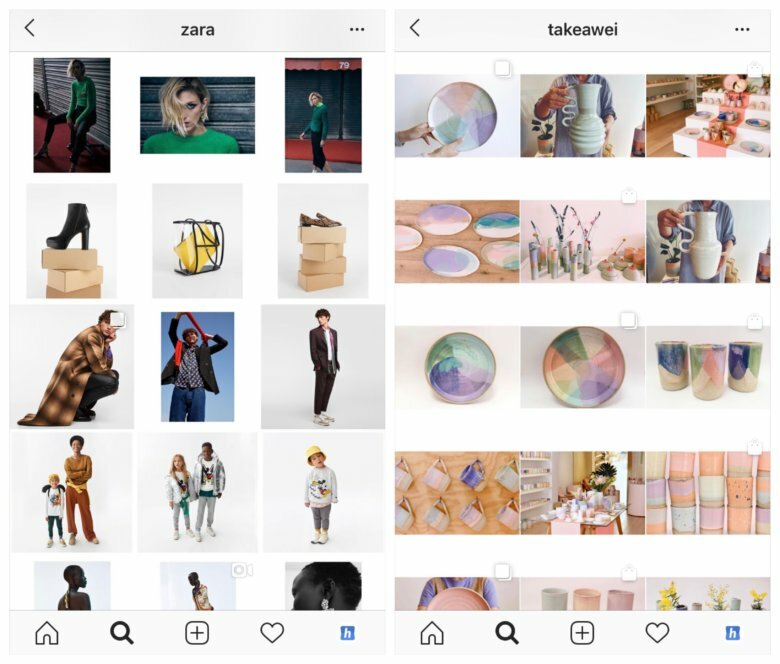 Zara and Takeawei both utilise white borders to create their Instagram feed themes. Many brands use a variety of content and photography types on Instagram. Whether it’s flat lay product shots, typography quotes, or UGC — using an Instagram grid planner does not mean you can only pick one! Why not incorporate the different forms of content your account posts into your feed theme? This could be in the form of a checkerboard or horizontal/vertical lines, and gives you the chance to be creative without restricting your content choices too much! Another way of utilising the grid to make your profile stand out is to make all 6 or 9 squares an image themselves! If you choose to do this make sure the individual squares work as individual posts, as that is how they will appear on your followers’ feeds! Aldi UK are masters of this, with their Instagram profile looking like a never ending table but each post focusing on a specific food item. Remember: if you choose to create an Instagram theme like this, you will always need to post in threes, so that the layout stays in tact. This is when an Instagram grid planner is necessary, as you can line up your posts into the grid theme and make sure the pattern matches up! These are examples of different kinds of grid patterns you can achieve on Instagram! At Hopper HQ, we built our own Instagram grid planner to help you perfect your feed aesthetic at the same time as scheduling your content for the coming weeks! The Instagram grid planner on Hopper HQ allows you to see what your Instagram profile will look like once all your scheduled posts have been published. This is incredibly useful if you’re trying to create a theme like we’ve listed above! You can drag and drop your posts around to test the best combinations and layouts before they are sent to your Instagram account. For colour matching, or a pattern created by vertical or horizontal lines, the grid planner makes the process of creating a beautiful Instagram feed much quicker and easier. Regardless of your feed’s theme, you can use the Instagram grid planner to ensure no posts clash and ruin the pattern you’ve spent so long creating. On Hopper HQ’s Instagram, we use vertical lines for post type, such as our ‘Spotlight’ series and social media holidays, and horizontal lines for colour palettes. This would be far more confusing and long-winded if it wasn’t for the Instagram grid planner, as we can ensure the posts will be published in the correct order to keep our theme in tact! We use the Instagram grid planner on Hopper HQ to help us perfect our own feed theme! With Hopper HQ, you can bulk upload up to 50 photos and videos in one go, scheduling them as far in advance as you see fit while ensuring your grid feed remains consistent and striking. We believe this Instagram grid planner is a game changer for social media marketers! Say goodbye to the test Instagram accounts you were using to check for feed cohesion, and visually manage all your content in one place. Will an Instagram grid planner come to the app itself? Sadly, this feature only seemed to reach testing mode on Instagram, as it was never officially released in an update! This does however show that Instagram are clearly thinking of ways to help brands, influencers, and individuals plan their feed aesthetic and ensure their posts match the content already on their profile. 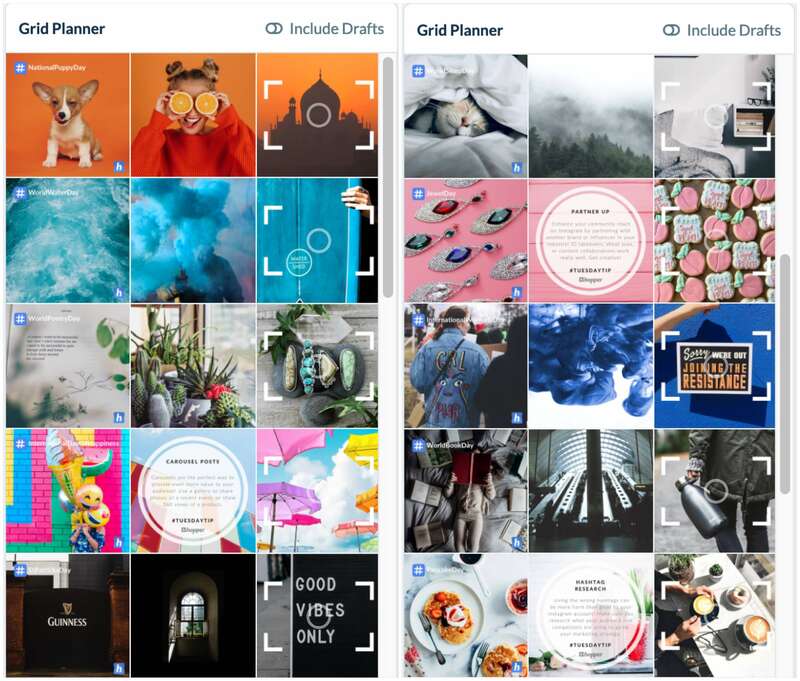 We’ll be keeping our eyes peeled in 2019 for a new Instagram grid planner feature release!